This tutorial demonstrates how to push data from a Form into a Data Repeater Flow. Before working through this first understand how to create a Repeater Form Control. For more information on Data Repeater, Form Controls	see attached link; https://documentation.decisions.com/create-repeater-form-control/ . In this example, the Forms have been designed to merge names together using a Join Strings Step	to form a full name with a middle initial. These Forms are created as an example of what you can do with a Form that has a Data Repeater embedded within it. The first step in creating a Data Repeater	that gets Form Data is to start by creating the Data Repeater and then create a Data flow for the Data Repeater. The Data Repeater	has a flow running in the background called Join Strings Flow. In theDesigner Folder locate the blue action panel and select Create Form,	chooseData Repeater	, choose the Repeater Control	and select Create. Name theData Repeater Form	and selectCreate. In theform designer ,click off of the Form. In theproperties, tab locate Form Data,	define theInput Type	for the Data Repeater. Select Pick	and choose from a list of Entity or Data Types. For this demonstration choose Account	[Decisions Framework.ServiceLayerservics] as the Input Type for the Data Repeater. Design the Data Repeater Form	in the form designer. The image below shows a basic Data Repeater Form	with two labels, aDrop Down List	, and aTextbox. First edit the Drop Down List	on the left. UnderList Input Source	chooseStatic	from the drop down listand input the List Items, A, B, C.
Under Output Data	and under selected items choose Pick From Data	and select MiddleInitial	from the selection of form data. Next, edit the Textbox	on the right. Under Common Properties and under Data Name choosePick From Data	and select NickName	from the selection of Form data. Transition:	Now save and exit the form designer and navigate back to the designer studio. In the next step create a flow for the Data Repeater. Now its time to create a Data Flow, In this example the data Flow is named Join Strings Flow	. From the d esigner studio s elect Create	Flow	locatedon the blue action panel, choose the flow type and select Create. Name the Flow and selectCreate. In the S teps tab locate Data> Text	and select the Join Strings	step**. **	Drag and drop the step into the Designer Studio and connect the pathways from the Start step to the End step. Navigate to the Start step	and set the properties. UnderFlow Input Data	choose Show Editor	and input Data Names	. Name the Data, FirstName, MiddleInitial, and LastName, selecting each as string data. Navigate to the Join Strings step and in the properties tab under separator	set the value as Constant	and enter an underscore bar. Next, to Source	choose Build Array,	then choose Select from Flow and enter the data names. Under Output	choose Rename	and enter the name, JoinStrings_Output. This output name will be used to map the data from the Join strings Flow	into the Data Repeater Form when it is put into a main flow. Navigate to the End step	and set the properties. Under Output	select Show Editor. In Show Editor, create a Data Name called JoinStrings	with string as its dataType. Under Inputs and JoinStrings chooseSelect From Flow. Select from Flow Data theJoin Strings_Output	string. NavigateBACK	to the Data Repeater Form and open it in theform designer . In the properties tab under Data Flows select (Add New), this is where you will add the Join Strings Flow. Name this Join Name. Hover over the pencil icon to edit the flow data. Choose the Flow that will run behind the Data Repeater Form. Under Flow, select Pick	and select the Join Strings Flow. By selecting Update inputs, the Flow inputs are auto-populated. S elect the pencil icon to edit each input String. FirstName [String]:	The FirstName is defined in the Main Form. Select from the drop down list and chooseForm Input Data. The Form Input Name defined as Selected First Name. LastName [String]	: The Last Name is defined in the Main Form in the drop down list and is defined as Selected Last Name. This is the data name from the drop down list with the name Selected Last Name on the Main Form. Middle Initial [String]:	The MiddleInitial does not come from the Main Form. The middle initial input Type is a form component and that comes from theForm Data. Middle Initial. This is defined in the drop down list in the Data Repeater. This completes Part 1. of the Create Data Repeater Form and Data Flow example. Save and close the Data Repeater. In this example, we use the Data Repeater Component	and twoDrop Down List Component. Start by creating a Form, in the Designer Folder locate the blue action panel and select Create Form	. 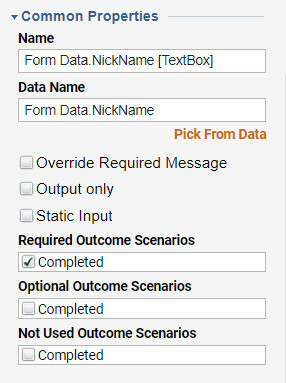 Choose fromNormal Form	, choose the type and select Create	and name. In this example, we name this form:DR Form. Locate in the Steps Tab Drop Down List	under Favorites> Drop Down List,	drag and drop two onto the Form designer. Finally locate a button component	, drag and drop onto the Form. Now set the properties for theDrop Down List	components. When you define the drop down list on the left the Output	must have a defined Data Name. In this example, we use the Selected First Name	as the Data Name. Note: This name needs to match the name set on the Data Repeater Data Flow input. When you define the drop down list on the right the Output	must have a defined Data Name. In this example, we use Selected Last Name	as the Data Name. Note: This name needs to match the name set on the Data Repeater Data Flow input. In the Form Designer, design the Form	as needed. 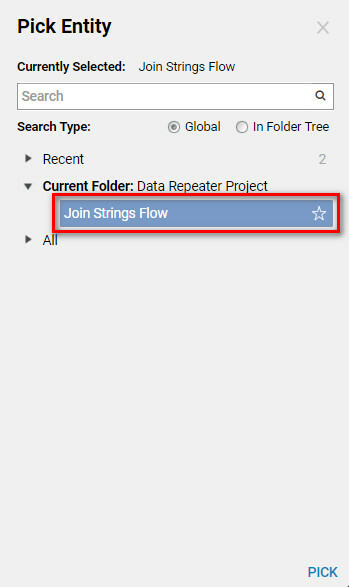 For this example in the Steps Tab locate User Controls>Data Repeater	,	drag and drop the Data Repeater Component	onto the Form. UnderCommon, Properties	select Pick and choose theData Repeater Form	previously created. Pick Data Repeater under Current Folder. The Data Repeater Form	should appear embedded inside theForm. 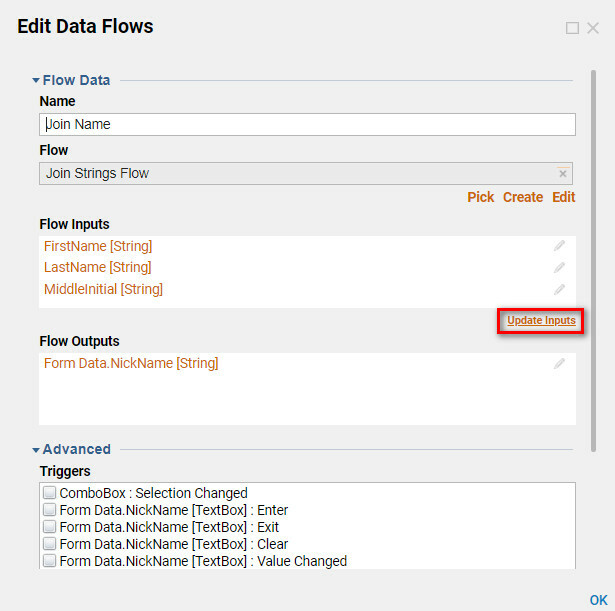 Creating the Main Form Flow uses the Form and the Data Repeater Form. Start by creating a new flow and name your flow, Main Form Flow. In the Steps Tab locate Show Form,	choose, Forms/Interaction>Pick or Create Form,	drag and drop step into Designer Studio. Select Pick	and choose Form	step,select the previously made custom Form. In this example the Form is named DR Form. In the properties tab under Inputs next to Data Repeater Data choose Constant. The Data Repeater Data needs to have an account Type. For this example the Data Name is Test. 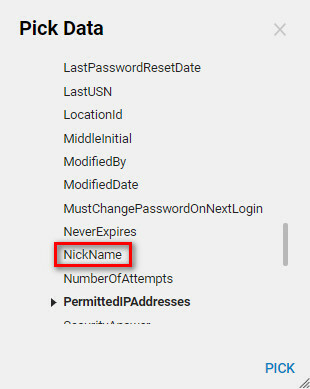 Scrolling down in Settings, give EmailAddress a defined name. In this example the EmailAddress Name is Test.